When the economy is tight, the marginal members of the headhunting business get very nervous because the low-hanging fruit disappears. They actually have to work to make a living. Meanwhile, the best headhunters are busy with challenging assignments because The Truth About Speeding Trains is that while they may slow down a bit for a curve, they don’t stop. These companies keep hiring, but carefully. You’ve probably heard me say that 95% of HR workers aren’t worth spit. And I usually put that in context by adding that 95% of headhunters aren’t worth spit, either. But look at the bright side. 5% of HR workers and 5% of headhunters have no competition. Many “headhunters” don’t know how to find new clients, and they sure don’t know how to find the best candidates. They pick the low-hanging fruit and call it a job. Let’s take a look at what this means, and how it affects you. Don’t give us low-hanging fruit. A headhunter recently wrote to me, complaining that her corporate clients don’t want her to submit resumes of people whose resumes are already plastered all over the job boards. We have seen a couple of clients indicate that they do not want to see resumes of candidates who have been sourced on the popular job boards (even if they have not sourced the candidate themselves). [“Sourced” means “found.”] We always clear the candidate on the client company to determine if they have been contacted or applied to the company. We would never submit a candidate who has indicated contact with a client company. Translation: We find resumes on Internet job boards and we send them to companies, hoping to get an interview, a hire, and a fee. Translation: This employer doesn’t want headhunters to submit resumes that are plastered all over the Internet job boards. The employer’s HR monkeys are already crawling all over those resumes. We own the low-hanging fruit. We feel that corporate recruiters are making these statements because they have been told that it is their job to find these people on Monster, Dice, etc. We know for a fact that they oftentimes do not contact all the candidates on these job boards that might match the requirement. We also have people referred to us through our network and they just happen to have their resume on Monster. My question is this: Do you have a good response to this particular objection? In my opinion they are cutting off their nose to spite their face. Thanks. Hmmm. Employers don’t want to pay $30,000 fees for people whose resumes are already all over the Internet. And this headhunter wants advice on how to compete with its HR clients for resumes that HR can get on its own for free. The fruit is, ah, rather RIPE. Sorry, but I agree with the employers on this one. Why pay headhunting fees for people who are on the job boards? In fact, why pay anything for people who spread their resumes all over kingdom come? Those resumes are free — and rather overly-ripe. In fact, most of them stink. The problem with those candidates is that their motivation to work for your own client is about as thin as the credibility of the job boards. (See CareerBuilder is for Dopes.) They have posted their resumes because they want a job, any job. My clients wouldn’t touch them with a 10-foot pole. My clients want people who want to work for them, not for any company that comes along. If your corporate clients pay internal recruiters to pick over resumes on job boards, someone ought to tell the board of directors that the flushing sound it hears is the recruiting budget going down the online toilet. Anyone who sources candidates on job boards should get out of this business. We get paid good fees to go find good people who are so talented that they’re not looking to jump on every “opportunity” that comes along. Just because HR is lousy at recruiting doesn’t give us an excuse to send a check to CareerBuilder every month and put our feet up. The problem you’re facing should make your firm realize its business model is founded on mediocrity. Armchair recruiting is not worth big fees. Racing your client to find resumes on the job boards “that match the requirement” is not a business. It’s monkeys competing with monkeys for low-hanging fruit. Meanwhile, I advise every job hunter with a brain to get out of the monkey house. The good headhunters are out in the field, finding and meeting the best-of-breed in the industry, and building relationships with them. Five years later, they may recruit those people — while you’re sipping a Diet Coke and filtering buzz words on Dice. 40%-70% of jobs are found and filled through personal contacts. Those contacts take years to cultivate. That’s why headhunters get paid $30,000 to fill a $100,000 position — not because they surfed Monster.com and beat a personnel jockey to candidate #30984213. It’s appalling that headhunters rationalize using The Job Board Dump to fill positions for their clients. Your business is in jeopardy because you’ve been pretending your monkeys are better than your client’s monkeys. Now, what should you do about your corporate client who doesn’t want you to send the drek that her staff is already sifting through online? Do what you get paid for. When the economy tanks, the best headhunters are still busy filling positions for hiring managers whose standards just keep getting higher. (Those managers often turn to headhunters without notifying their personnel monkeys.) The question is, how will you define your firm? Like I said, when the low-hanging fruit disappears, 5% of headhunters have no competition. The monkeys send threatening notes to one another about who is in charge of the low-hanging fruit. Meanwhile, Monster and CareerBuilder keep collecting fees — and the monkeys are falling out of the trees. Eeek – now I am scrambling to get my resume taken off Monster right now! Unfortunately, I was advised to post it there by a “friend” who worked in internal recruiting at a large online retailer in Seattle. “We use Monster ALL the time,” she says. And I should have known better: this same HR wiz of a “friend” who constantly bragged about her $120K-a-year salary got fired for getting drunk with direct reports and mouthing off in front of company execs. Next time, I’ll check with Nick first! Meanwhile, off to yank my resume off Monster. The problem with the notion that people whose resumes are on the job board are not worth anything is that I have encountered companies who *only* hire through those boards. 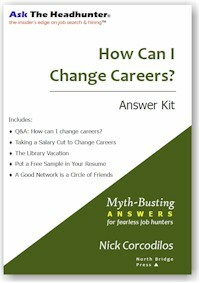 I have hunted for another way in, only to be referred back to the link that required me to register with CareerBuilder. Argh! OTOH, there was one position posted to one of those sites that I was able to locate on their own website. So I do recommend other readers look to see if there is another way to apply. I have been in job search mode this summer and have been most successful when I located contacts outside of HR and CCd HR when I did submit a resume to my contact. Nick, I’d like to thank you. I’ve had this feeling for a while, but this article confirmed it – I’m not in your target audience. Your target audience seems to be well-off people who don’t have trouble getting jobs, just getting the right job. I’d suspect most of your readers aren’t in your target audience either, so it’s pretty bold of you to admit that you see most of us as “low hanging fruit”, whose resumes are “ripe”. Again, thank you for your candor. Tim, thanks for your comments, but headhunters place lots of people who are not “well off.” The profession would have you believe it deals mostly in the rareified income strats, but the truth is, headhunters make most of their money at mid-level salaries. When I talk about “low-hanging fruit,” I don’t mean low salaries. I’m referring to resumes on the job boards that “sorta kinda fit” a job requirement. These headhunters pull them down and submit them to HR departments who are “sorta kinda happy” to hire someone, anyone. In most companies, HR has no skin in the game. They don’t get rewarded for hiring great people; just for filling positions. And that’s the problem. 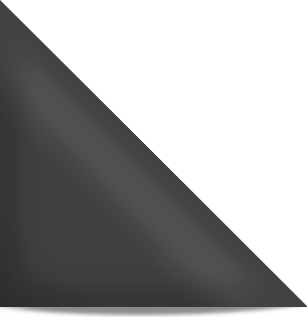 Mediocrity in HR promotes (and pays!) mediocrity in the headhunting business. The “low-hanging fruit” are people who will take a job, any job, with the result that they are soon job hunting again. You could be earning $30,000 and still be picky about where you work because you want to build skills and increase your value. Now, I’ve got no gripe with anyone who snares a job just to pay the rent – that comes first. But the smart job hunter goes to lengths to cultivate relationships that lead to really good jobs where skills grow and the person’s value grows, too. In my opinion, most of those people aren’t out plastering their resumes all over the place. They’re looking for their next job quietly and carefully, because they’d rather not do it again in another year. I agree with most of what you say. The job boards pewk a bunch of people to HR in a high volume and impersonal way. Some or maybe a majority may be without direction looking for anything that comes their way, but not all folks. I have a friend who was an expert in AutoCad and taught it for ten years. With a well written resume containing key words, he was contacted one day after posting on Dice and eventually hired. I think you might state that relying on or spending any more than 10% of your job search effort on the internet is a waste of time. I wonder how well do companies that want to screen those that plaster their resume everywhere check that the candidates coming from firm XYZ aren’t also posted on Monster, Dice, CareerBuilder, etc. My experience with job boards is that they are a way to get to recruiting companies which can almost be like roulette in terms of when will there be jobs, when will they hear back from sending a resume/doing a phone screen/doing an interview. Some recruiting companies will do more than just a handshake and see your face and body, which is nice but why is it so rare? Don’t they want the candidates to succeed and get the job or are they just pigs being led to slaughter unless the pig is MacGyver and figures a way out of the trap? Companies may need to give some thought to employee-relationship management which may be a new field coming soon to a company near you. Or is that too cliche to say? JB, it’s rare because the cost of entry to the headhunting business approaches zero. In Silicon Valley back in the 80’s we joked that all it took was a pencil and a dime. The dime was for the phone booth, and the pencil to write on the wall. No office required. I think it’s comparable today. There are simply too many fast-buck artists in the business, and they behave like slobs. It truly is rare to encounter a good, legit headhunter. 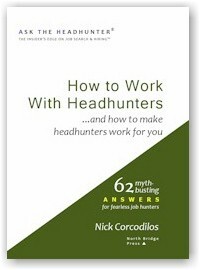 Remember that only about 3% of positions are filled by headhunters. Proceed accordingly. Love your idea for a new field… I’ll believe it when I see it. It seems to be pretty black and white. Companies either do it right, or they don’t. 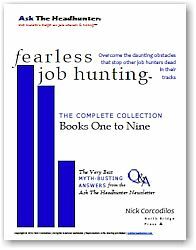 If 4% of jobs are filled by job boards and 3% are filled by headhungers, how are the remaining 93% filled? Do you have statistics on the percentage filled by newspaper ads, university placement offices, professional organizations, and networking, etc? I have been recruiting for over 3 ½ years now. I have listened to the great debate of over whether recruiters should get off their duffs and go out and “find” candidates using a variety of headhunting tactics or should we use job boards and on-line search techniques. Here is my opinion, for what it is worth. I have used all kinds of techniques to find suitable candidates for my clients and here is the bottom line, who cares where they come from as long as you are able to find the most talented, capable and skilled employee to meet the needs of the company that is hiring? There are two kinds of candidates, the active candidate and the passive candidate. Just for fun let’s look at the definition of these two people. 1. Active candidate – someone who can see the handwriting on the wall in their current position and is preparing to be out of work, is getting their resume ready and starting to look. Or they have been “downsized” through no fault of their own and are searching for a more secure, stable environment to go to. They are anxiously engaged with companies and recruiters and traditionally responsive and quick to keep appointments for telephone and personal interviews. Even top-level executives realize that the best place to begin a job search is to get their resumes posted on the on-line job boards (Monster, Career Builders, etc) and on professional affiliate job boards (SME, APICS, etc). 2. Passive Candidates- someone who is happy in their position, usually not job searching and who feels secure in his corporate position. When approached by a recruiter, may be mildly interested in the proposed job but has no real incentive to begin the arduous task of updating a resume, interviewing and considering selling their home and relocating to a new city. 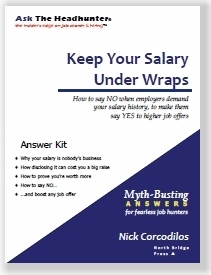 Often times the passive candidate is annoyed or downright offended that a recruiter intrudes on his work time to offer up a position that he does not want, even for a substantial increase in salary. If a passive candidate has even the slightest inclination that his position is in jeopardy his first feeler in the job market is to list his resume on one of the on-line job boards under a “confidential” jacket to see if there is anything open in his field. Given the definition of these two types of candidates, I’ll take the active candidate all day long. This person wants and needs a job. They are looking for anyone who can help to match them up with the right company. The trick, in my opinion, is to be able to sift through the thousands of resumes to find that perfect candidate without losing your mind. Typically this takes hours, days, and weeks of concerted effort. The human resources manager that has this thrown upon them by corporate management is already drowning in day to day personnel issues and has a constant stream of employees who are at their office door for advice, comfort or help of some sort. They also typically do not have the kind of manufacturing or technical background to be able to sort through the hundreds of details on each resume that give clues to whether or not a candidate will fit into the skill set and culture that the company needs. They certainly could be trained to do this but who ever has the opportunity to train them or even recognize that it is needed? Recruiters beware. All of the hype about passive candidates is not always gospel. Granted, perhaps the “perfect” candidate may be out there working. The world has changed, when the labor market is tight and the best candidates are hard to find you may have to seek out the employed person. However, give me a good active candidate that has his (not-so-perfect) resume out all over the internet who will respond to my emails and phone calls immediately, who has integrity and the exact skill set that I need – I’ll take him! I publish my resume’ because I am looking for people and companies who seek services I choose to sell. If they also seek some sort of fealty, then perhaps I’m not what they’re looking for. But professionally, I am successful. I understand your hypothetical company’s distaste for the recruiting fee. But if they don’t want me because they found me… on the bathroom wall, even!… then they’re dumb. Your client has ten feet poles against me? I’m not jumping at every opportunity. I jump at the best of them. How do you think relationships form, anyway? Exposure of legitimate service is part of sensible marketing communications, and all channels are fine with me. Let the anti-CareerBuilder forces follow their folley!